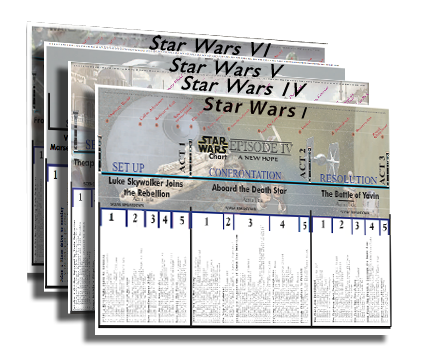 The HOLLYWOOD SCRIPT FORMAT CHART™ shows you how to create successful stories in perfect script format. This chart describes the ancient power of myth in detail as it applies to all stories in the hero’s journey model. It includes the 10 Commandments of Screenwriting, plot points, hooks, and emotional curves. It also includes the golden paradigm-three act structure, formatting and submission tips, and the page number breakdown. The first “Act” of Pulp Fiction follows a story through VINCE VEGA’s eyes and centers on his relationship with his boss’s wife MIA. He is asked by his boss to take Mia out while his boss is out of town, but he’s aware that his boss almost killed another man for rubbing Mia’s feet. Obviously, this is a touchy situation, but it only gets worse when Vince meets her and starts to like her. They enjoy an intimate meal and return home in a romantic, dancing glow. That’s when Mia mistakes Vince’s heroin for cocaine and overdoses on it while he’s not looking. Vince has to save her or face his deadly boss’ wrath. He returns to his heroin dealer and through desperate measures, they revive Mia and save her life. Vince returns Mia to her house and blows her a kiss goodnight, feeling affection for her that he will never reveal. Our soul goes through life experiencing the many archetypes of human existence. It watches its story like a movie on a screen. That story is based on divine spiritual formulas that were first discovered ages ago by the great sages and mystics of many religious teachings. The Spiritual Script Chart shows how a great story is developed by a treasury of wisdom hidden deep within our creative consciousness. This chart is like the Hollywood Script Formula Chart using the 3 act structure as the backbone of story. It also brings together a tapestry of new age thought into a new story model incorporating the mind, body, and spirit. It follows along with the 7 key spiritual turning points, superimposed on the seven chakras in the body, the 7 rays, the 7 Earth kingdoms, the 7 archangels, the 7 planes, the Cabalistic tree of life, the seven dimensions of light, color and sound, soul psychology, philosophy, and metaphysics.